The Flat-Top Mille Graines (Corymbose Hedyotis/snake tongue grass - 伞房花耳草/傘房花耳草, sometimes called 水线草/水線草 or not so appropriately 伞房蛇舌草/傘房蛇舌草) is a common weed that will grow in any nook and cranny, provided there is ample moisture and enough light. Known as rumput mutiara (pearl grass) in Malaysia, it can withstand strong sunlight, but grows into a lush herb if grown in the shade. 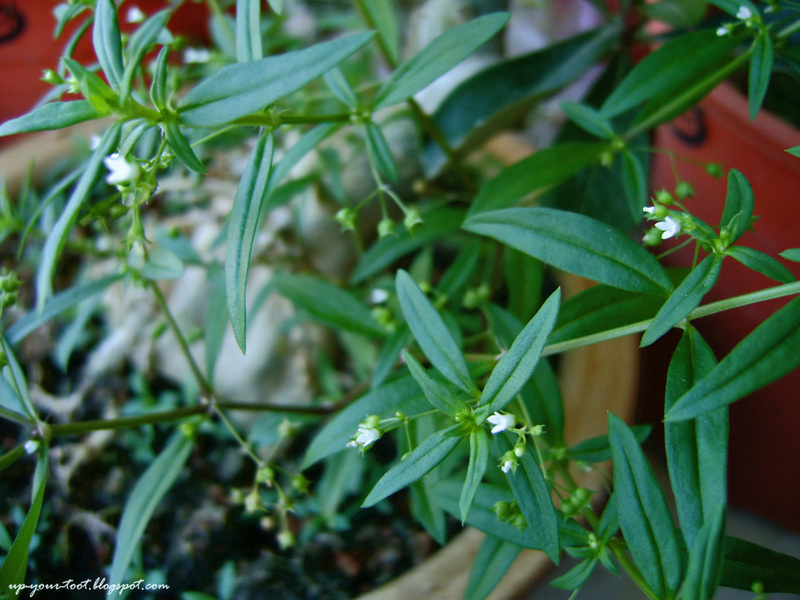 This plant is usually used in place of its more famous relative, the white-flowered snake tongue grass (白花蛇舌草). Oldenlandia corymbosa L. (syn. 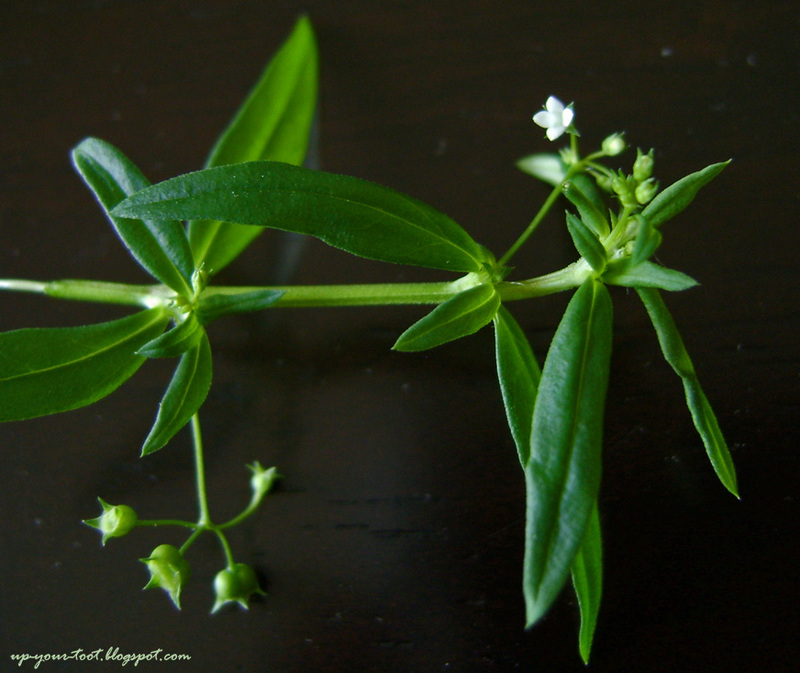 Hedyotis corymbosa (L.) Lam), also commonly known as Old World Diamond-flower. The squarish stems and cymose inflorescence differentiates it from a close relative, O. diffusa. The most obvious difference between the two plants (and is reflected in the specific epithet) is that Oldenlandia corymbosa has axillary cymose inflorescence whereas Oldenlandia diffusa have flowers that arise singly or rarely, in pairs from the leaf axil. The leaves of O. diffusa are also much narrower and snake-tongue like (linear-lanceolate), whereas O. corymbosa have distinctively more oblong-linear lanceolate leaves. O. corymbosa have up to 5 flowers per inflorescence that is small and white in colour, thin, and broadly tubular with 4-lobes. 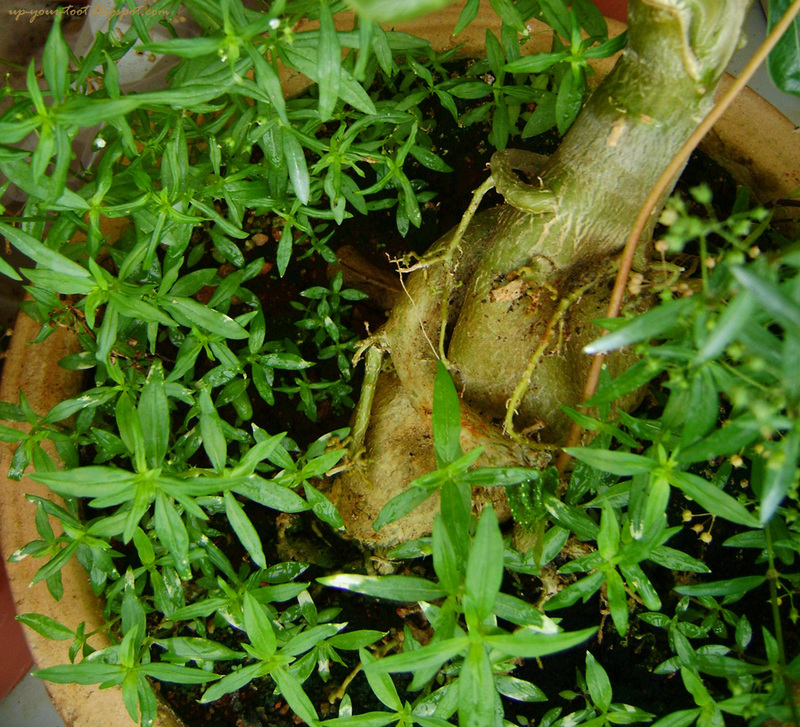 The use of this plant is well-documented in both traditional Chinese medicine and Ayurvedic medicine. Mature Oldenlandia corymbosa plant with flowers and fruit capsules. In Traditional Chinese Medicine (TCM), O. corymbosa and O. diffusa have overlapping characteristics, but are not the same. Whilst both are anti-inflammatory and anti pyrexic, the anti-neoplastic character is strongly attributed to O. diffusa but only slightly to O. corymbosa. TCM characteristics for O. corymbosa is 甘淡、微辛苦、寒 (lightly sweet, slightly acrid-bitter, cold) whereas for O. diffusa it is 苦,微甘, 微寒 (bitter, slightly sweet, slighly cold). Seedlings of self-sown Oldenlandia corymbosa. On the top-center of the picture you can see branches of the plant with ripened fruit capsules that must have dropped many, many seeds into the pot below. The whole plant of O. corymbosa is used either on its own or combined with other herbs for detoxification, as an antipyrexic, for malaria, inflammed bowel, appendicitis, inflammatory swelling, tonsillitis, laryngitis, bronchitis, urinary tract infections, burns, bruises and snakebites. If you can collect a big bunch of O. corymbosa, a cooling, but almost tasteless tea can be brewed from the dried plant material. However, you will need to collect quite substantial amounts of O. corymbosa, wash and then dry it. If you are planning to use collected plants from roadsides or parks, do make sure that they have not been sprayed with chemicals. The easier way would be to go buy commercially available Oldenlandia tea from the supermarket, which is made from O. diffusa. In the past, I have tried to sow and transplant this weed herb into containers to grow enough of it so that I can harvest it like a crop to make Oldenlandia tea. Unfortunately, they seemed to refuse any attempts of systematic cultivation forced upon them. 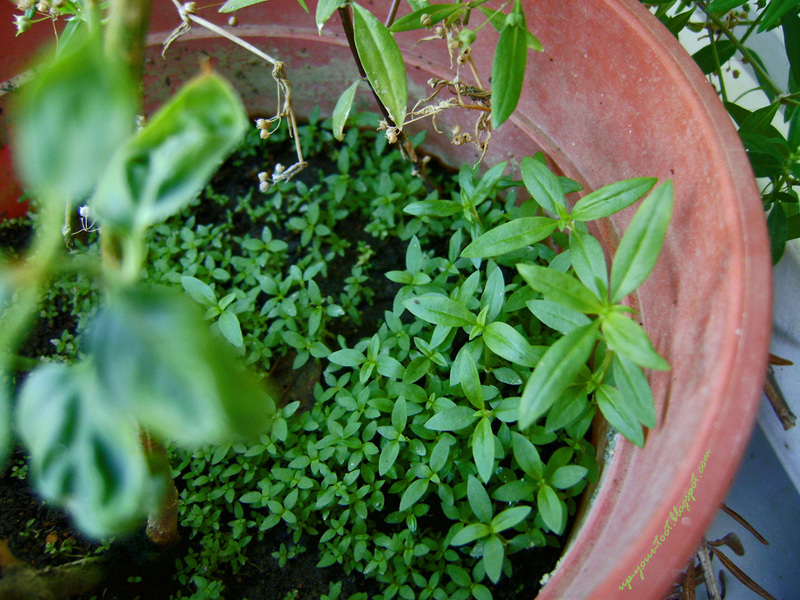 Now, when I have no desire to grow them, lo and behold they sprout in almost every pot that I have on the balcony. Oldenlandia corymbosa taking over my Adenium pot! Also trying to muster in on some action is a strawberry runner. The taxonomic position of Oldenlandia is somewhat unresolved. The genus Oldenlandia was created by Linnaeus in 1753 to honour the Danish botanist Henrik Bernard Oldenland. Some botanists do not recognise the genus Oldenlandia, and plants in this genus was transferred to the genus Hedyotis, thus Oldenlandia corymbosa becomes the basionym for Hedyotis corymbosa. Recent works on the genus Hedyotis resulted in the members of that genus being narrowed down, making the genus Hedyotis monophyletic and resulted in the removal of many members that were previously placed in Hedyotis, including H. corymbosa, H. diffusa and H. auricularia. So for now, they are back to Oldenlandia. The story does not end here, for the treatment of what plant should be in Oldenlandia may still change, since it is, as a genus, several time polyphyletic. The information presented on this article is intended for educational purposes only. It is not the intention of the writer to advice on health care and the information listed on this page are not a substitute for professional medical advice. Please see a medical professional about any health concerns you have. Banyak popping out tu...nakal juga herba ni ya. I have lots of weeds in my flower pots which look like these. I wonder if those in my garden can be collected to brew tea? If you are sure it is Oldenlandia corymbosa, you can either use it fresh or dry it in the shade(阴晒) and collect enough to brew the tea. Oklah can make some stock for the coming warm weather. Dengar Klang valley hujan sekarang. Yes. Skrg hujan petang tapi midday panas sangat. A bit iffy for plants sebab lembab lewat petang mesti kena kulat etc.